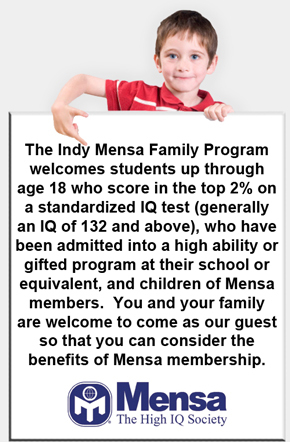 Nearly three and a half years ago we launched our Indy Mensa Family Program. At the time, we were expecting to grow to about a dozen kids in five years. Being a rural state, that seemed reasonable. The demand for a special place for intellectual peers to get together to socialize and enjoy unique programs designed specifically for bright kids along with opportunities for parents to have group discussions with professionals specializing in gifted kids was exponentially higher than we ever expected! The number of card-holding Young Mensans in Central Indiana has grown by a thousand percent in these past three and a half years, and literally hundreds of youth and parents have found support, encouragement, and a place to finally feel normal. We are a diverse group, but we have so much in common. One of the biggest joys of my life has been to see our Indy Mensa Family Program develop and mature into a sustainable program that not only brings the benefits of Mensa to young people, but allows us to dream big and see those dreams become a reality. When we first started, I put together a web site designed for a small program in rural Indiana. It didn’t take long to realize that the web site wouldn’t be able to keep up with our growth. Two years in the planning, we’ve put together everything we’ve learned to make a functional web site to meet the needs of our current program. We hope the new site will improve the effectiveness of our communication with you as well as help new people better understand what we do. We have the old site archived here. Programs: The tool we use to bring everyone together is our high quality programs developed specifically for bright kids. Teachers trained in gifted education review every program in great detail before we decide to run it. Because we have so many programs, a lot of the work that went into the new web site was to organize all of the information clearly and efficiently. We found an excellent calendar plugin that does most of the work for us. There is an “Upcoming Events” widget on the right column of every page so you can see what we have coming up. One really cool feature is that you can automatically add our events as we post them to your digital calendar. It works for Outlook, iCal (for Mac), and Google Calendar. Even if you don’t come to every event, at least you’ll see it on your calendar as a reminder. “Featured Programs” is the first page you come to when you load the site. It highlights several of our programs and showcases the various program series that we offer such as Smart Science, Leadership Development, Summer Blast, Arts & Expression, and more. The Programs category also includes other stuff like photos & video, and general information that people need to know about our programs. Blog: This is a new feature of this web site. Most of the information on the site is static, but the blog posts will allow you to read the latest happenings of our program. About Us: If you want to know who is who, this is where you want to go. You can read the Letter from the Director, see some featured bright youth in our area, and learn about the people who volunteer to run our program. Email Updates: We’ve simplified the form to get our email updates. If you’ve already registered on the old site and are getting email updates, we’re migrating everything to the new site, so you don’t have to re-register. If you’re new, please sign up so we can send you the latest news. You can easily unsubscribe at any time. Resources: Other than learning about our programs, this is probably the single most important feature of our site. We’ve put together a list of everything we think you should know about raising and educating a gifted child. We help you find a good school for your child, we help you get scholarship money, we help you find professionals that do IQ testing, counseling, and other services, and finally there are lots of articles to read so you can know what the latest research shows about raising gifted kids. Contact: Need to ask us a question or have suggestions? This is the one-stop-shop to reach us. Mensa: So you’ve enjoyed our group and want more. It’s time to join Mensa. This section tells you why, how, and how to connect with our local chapter, Central Indiana Mensa. Sitemap: Not everyone has a fancy browser, so this will make our site accessible for everyone.